It’s just over one month since the Hornsdale power reserve was officially opened in South Australia. The excitement surrounding the project has generated acres of media interest, both locally and abroad. South Australia is home to the world’s largest battery – a 100/129 MWh system installed at the Hornsdale wind farm. The aspect that has generated the most interest is the battery’s rapid response time in smoothing out several major energy outages that have occurred since it was installed. Following the early success of the SA model, Victoria has also secured an agreement to get its own Tesla battery built near the town of Stawell. Victoria’s government will be tracking the Hornsdale battery’s early performance with interest. Over the full month of December, the Hornsdale power reserve generated 2.42 gigawatt-hours of energy, and consumed 3.06GWh. Since there are losses associated with energy storage, it is a net consumer of energy. This is often described in terms of “round trip efficiency”, a measure of the energy out to the energy in. In this case, the round trip efficiency appears to be roughly 80%. The figure below shows the input and output from the battery over the month. As can be seen, on several occasions the battery has generated as much as 100MW of power, and consumed 70MW of power. The regular operation of battery moves between generating 30MW and consuming 30MW of power. As can be seen, the the generation and consumption pattern is rather “noisy”, and doesn’t really appear to have a pattern at all. This is true even on a daily basis, as can be seen below. This is related to services provided by the battery. There are eight different Frequency Control Ancillary Services (FCAS) markets in the National Electricity Market (NEM). These can be put into two broad categories: contingency services and regulation services. Contingency services essentially stabilise the system when something unexpected occurs. This are called credible contingencies. The tripping (isolation from the grid) of large generator is one example. When such unexpected events occur, supply and demand are no longer balanced, and the frequency of the power system moves away from the normal operating range. This happens on a very short timescale. The contingency services ensure that the system is brought back into balance and that the frequency is returned to normal within 5 minutes. In the NEM there are three separate timescales over which these contingency services should be delivered: 6 seconds, 60 seconds, and 5 minutes. As the service may have to increase or decrease the frequency, there is thus a total of six contingency markets (three that raise frequency in the timescales above, and three that reduce it). This is usually done by rapidly increasing or decreasing output from a generator (or battery in this case), or rapidly reducing or increasing load. This response is triggered at the power station by the change in frequency. To do this, generators (or loads) have some of their capacity “enabled” in the FCAS market. This essentially means that a proportion of its capacity is set aside, and available to respond if the frequency changes. Providers get paid for for the amount of megawatts they have enabled in the FCAS market. This is one of the services that the Hornsdale Power Reserve has been providing. The figure below shows how the Hornsdale Power Reserve responded to one incident on power outage, when one of the units at Loy Yang A tripped on December 14, 2017. The regulation services are a bit different. Similar to the contingency services, they help maintain the frequency in the normal operating range. And like contingency, regulation may have to raise or lower the frequency, and as such there are two regulation markets. However, unlike contingency services, which essentially wait for an unexpected change in frequency, the response is governed by a control signal, sent from the Australian Energy Market Operator (AEMO). In essence, AEMO controls the throttle, monitors the system frequency, and sends a control signal out at a 4-second interval. This control signal alters the output of the generator such that the supply and demand balanced is maintained. This is one of the main services that the battery has been providing. As can be seen, the output of the battery closely follows the amount of capacity it has enabled in the regulation market. 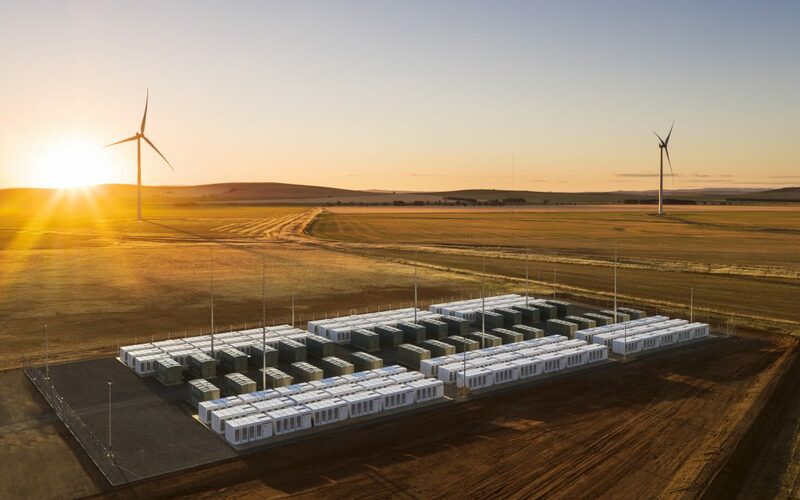 Not to be outdone by it’s neighbouring state, the Victorian government has also recently secured an agreement for its own Tesla battery. This agreement, in conjunction with a wind farm near the town of Stawell, should see a battery providing similar services in Victoria. This battery may also provide additional benefits to the grid. The project is located in a part of the transmission network that AEMO has indicated may need augmentation in the future. This project might illustrate the benefits the batteries can provide in strengthening the transmission network. It still early days for the Hornsdale Power Reserve, but it’s clear that it has been busy performing essential services and doing so at impressive speeds. Importantly, it has provided regular frequency control ancillary services – not simply shifting electricity around. With the costs and need for frequency control service increasing in recent years, the boost to supply through the Hornsdale power reserve is good news for consumers, and a timely addition to Australia’s energy market. This article was first published on The Conversation. Read the original article.